"In the 1920s America became a high-rise nation. By 1927, the country boasted some five thousand tall buildings -- most of the world's stock. Even Beaumont, Texas, had six buildings of ten stories or higher, which was more than Paris, London, Berlin, or any other European city. The J. L Hudson Company of Detroit in 1927 opened the world's tallest depart­ment store, at more than twenty stories, and Cleveland saw the topping out of the fifty-two-story Union Terminal Building, the second-tallest building in the world. Los Angeles instituted strict limits on building heights -- which is partly why L.A sprawls so today -- but still allowed the city hall to rise to twenty-eight stories in violation of its own ordinances. It was as if the country couldn't stop itself from building ever upward. "As buildings grew taller, the number of workers pouring into city centers grew and grew. Boston by 1927 had 825,000 people a day com­ing into its downtown -- or more than the entire population of the city. Pittsburgh absorbed 355,000 workers every day; Los Angeles and San Francisco 500,000 each; Chicago and Philadelphia over 750,000 apiece; and New York, superlative in everything, took in a whopping daily load of 3 million. 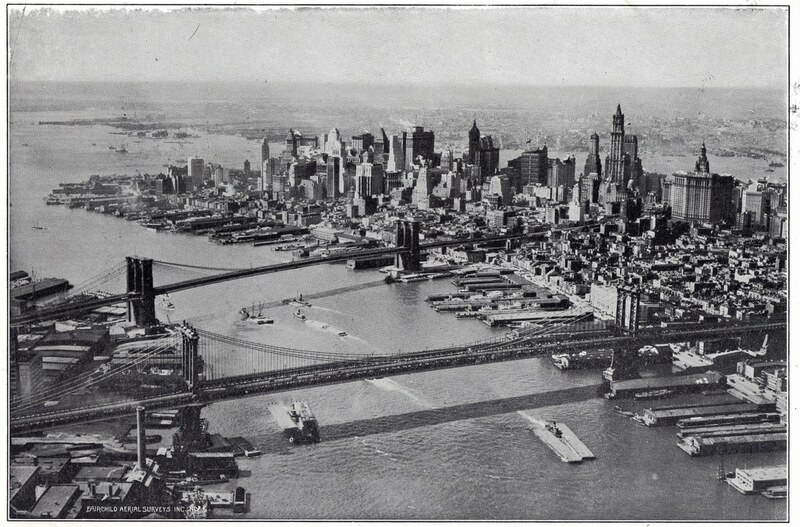 View across the East River, taking in Manhattan and Brooklyn bridge (1928). "Every four years the city grew by the equivalent of a Boston or St. Louis. Developers couldn't keep up. At one point in 1926, more than a thousand new office buildings were being constructed or rebuilt. To try to reduce the crowding, the City of New York enacted tough new ordinances, restricting tall buildings to big lots and forcing architects to design them with setbacks to allow more air to flow between them and more light to reach the ground. The unintended effect of this was actually to accelerate the pace of growth, since big lots required giant structures if they were to offer an economic return. It also encouraged skyscrapers to march northward up Manhattan. By 1927, New York City had half the nation's skyscrapers, and half of those were in Midtown. The canyonlike streets and spiky skyline that we associate with New York is largely a 1920s phenomenon."